A new highway will ease congestion in the nation’s capital but it comes with costs. 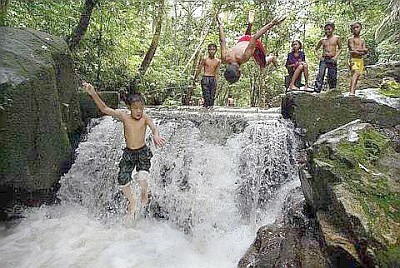 IN August 2005, the Selangor State Park was launched with much fanfare. Sprawling well over 108,000ha, this park is the third largest in the country and is even bigger than the state of Perlis. But today, barely five years into its existence, the park faces a grave threat – a highway will plough through parts of it. Aimed at dispersing city traffic, the Kuala Lumpur Outer Ring Road (KLORR) will link Rawang to Cheras. 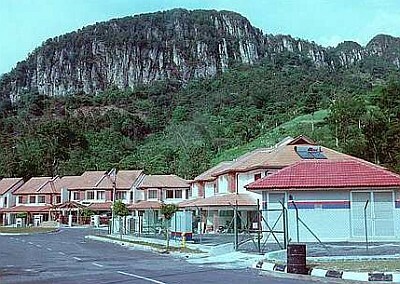 A portion of the route, however, will bisect the geologically unique Klang Gates Quartz Ridge in Hulu Kelang, as well as cut through the Hulu Gombak, Ampang and Hulu Langat Forest Reserves. 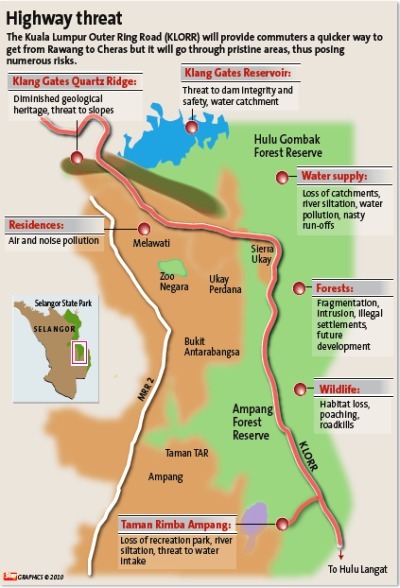 The consequences of this will be multiple and dire: disturbance to the water catchments of the Klang Valley; pollution of water sources; risks to dam integrity and safety; noise and air pollution in residential areas; threat to a geological heritage; destruction and fragmentation of forests; and loss of wild recreation areas. Many are opposing the project, which came to light when the Ampang Jaya Local Plan 2020 was displayed for public comments late last year. The project drew the largest number of objections – from 1,040 residents. Nine conservation groups, citizen groups and residents’ associations have collectively submitted memorandums to Prime Minister Datuk Seri Najib Tun Razak and the Selangor Government, urging for the project to be scrapped due to its social and environmental ills. At the same time, an online petition by the group Friends of Ampang Forest has got almost 700 supporters. Work on the western route of KLORR – from Templer’s Park in Rawang to Karak Highway – has commenced, with tracts of Kancing forest reserve being cleared. The eastern route, which links Karak Highway to Silk Highway in Cheras, is now under study, and its detailed environmental impact assessment is expected by year-end. The scope of this study (the term of reference) is now being finalised. The Hulu Gombak, Ampang and Hulu Langat Forest Reserves may be protected water catchments and part of the Selangor State Park but there is no assurance of their safety. The KLORR will cut these hilly forests, possibly silting up streams and stemming the water supply of Kuala Lumpur and Selangor. The steep slopes that define much of these forests make them ecologically vulnerable when developed. In fact, the landslide-prone area of Bukit Antarabangsa was built on degazetted portions of these very forests. The upstream location of the KLORR will see it crossing numerous streams and rivers, according to Dr Maketab Mohamed, a water quality scientist from Universiti Teknologi Malaysia. The affected sites include the catchments of the Gombak and Ampang rivers (which are part of the greater Sungai Klang catchment) as well as the Sungai Langat catchment. Two water intakes are at risk: the Klang Gates Dam and the Bukit Belacan intake in Taman Rimba Ampang. Whether other water intakes in Hulu Langat will be affected is still unclear as the road alignment for that portion has not been revealed. “During the construction phase, the main impact on water quality will be increased turbidity in streams due to soil erosion,” says Maketab, a member of the impact study review panel. “It is not easy to control turbidity. The common method is to have silt traps but these are effective only if well maintained. The riparian zone on both sides of streams must be maintained as it acts as a filter, aside from being the habitat for many animal species. Kids enjoying themselves at the Taman Rimba Ampang in Hulu Ampang. The natural beauty of this park and its clear streams might be impacted by the KL Outer Ring Road. Maketab also raises the possibility of large chemical spills, as has happened several times along the East Coast Highway, necessitating the closure of the Sungai Gombak water treatment plant. He says the project consultant must demarcate the watersheds for the water intakes and ensure that spilt chemicals do not get into the public water supply, such as with an early warning system. Not many KL-lites know of the globally important geological feature in their backyard: the Klang Gates Quartz Ridge that dominates the skyline of Hulu Kelang. Not only is it the longest quartz ridge in the world, it harbours five plant species that grow nowhere else. The KLORR will pass through the quartz ridge, also known as Bukit Tabur, at where a gap separates the massif into two, and slopes might have to be cut. “We have this important geological monument but instead of conserving and enriching it, we’re building a structure that will diminish its value. Building a road in front of the ridge might jeopardise the state government’s plans to have it listed as a Unesco Heritage Site,” points out Leela Panikkar, director of conservation group Treat Every Environment Special (TREES). “Siting the highway in sites listed as Environmentally Sensitive Areas appears to be a contradiction in planning. Community feedback was also not considered. The road proposal remained unchanged although residents had protested when they first learnt about it from the Ampang Jaya Structure Plan in 1998, and again when the local development plan was opened for public comment (late last year),” she adds. Housing development is edging ever closer to the Klang Gates Quartz Ridge, obliterating the original lowland forest. The changed landscape will impact the native vegetation of the outcrop. As the highway will run close to the Klang Gates reservoir, there is another concern: the impact of piling works on the dam, which was built nearly 60 years ago. “The safety of the residents of Taman Melawati is at stake if anything should happen to the structural integrity of the dam. The entire township could be flooded,” says Leela. Ironically, RM5mil bungalows and other high-end properties are coming up in the foothills of the ridge and developers are touting the scenic view as a selling point. Are purchasers aware that the panorama would be marred by a highway running through? By cutting through the Hulu Gombak and Ampang forests, the KLORR will fragment these wilderness and push wildlife such as gibbons, tapirs and leopards, among others, to the brink. The survival of these species hang on healthy, intact forests. Fragmented forests, on the other hand, are vulnerable to degradation. With a highway running through, these forests will be more accessible to poachers and intruders, as seen with the East-West Highway that traverses the Belum-Temengor forests in Perak. Increased roadkills are likely. The Malaysian Nature Society Selangor Branch points out that when a highway was built through the forests at Bukit Cherakah near Shah Alam in Selangor, at least seven tapirs were knocked down by motorists. “I just can’t believe that they think this is a good idea. This is the last bit of pristine lowland forest that we have near Kuala Lumpur. We do not have the right to take it away,” says Dr Catherine Yule, a resident of Taman TAR which borders the Ampang forest. She and other nature lovers routinely trek into the forest that is literally her backyard, seeking out untouched waterfalls and wild flora and fauna. “The forest there is of great significance, being the catchment forest for the Klang Gates reservoir. That reservoir supplies water for the city. If we put the road there, the water quality will be gone. We don’t believe this is a solution to our transportation problem. Public transportation needs to improve,” says Yule, a lecturer in tropical biology. Similarly at stake is the Taman Rimba Ampang, a pristine recreation site in Hulu Ampang that draws many picnickers and birdwatchers. If the KLORR branches off at this park, as indicated in the Ampang Jaya Local Plan, earthworks might silt up streams and impair the Bukit Belacan water intake point located there. He also sees no logical reason to route the highway through the forest. She says we also need to consider lessons learnt from the development of other highland highways such as the Simpang Pulai-Lojing road in Perak and Pahang, where erosion and landslides have routinely rendered that road unsafe and unusable. Until press time, Puncak Niaga, Selangor Forestry and project proponent AZRB have yet to respond to interview requests from The Star. During EIA meetings, however, the Minerals and Geoscience Department has pointed out the fragility of the terrain in the quartz ridge and objected to the road going through it. Puncak Niaga also voiced concerns over the possible impact on water catchment, water pollution and flooding. That the proposed route was based on an outdated 1996 study was also raised at meetings. Apparently, the least environmentally harmful of three proposed routes was not chosen. As this route will traverse many squatter settlements and communities, land acquisition will drive up costs. Another route was rightfully dismissed as, with over half of the road cutting across forests, it will be the most ecologically unfriendly. In the end, the chosen alignment was the one with the lowest cost – lowest in terms of engineering and construction costs, that is. Once the ecological and social costs are considered, the so-called cheapest route might well turn out to be the most expensive one.